Come “Deck the Halls” from 4:30-6:30 PM as we make ready for the season! Praise Kids will rehearse at 4:30 PM and when they are done will have the opportunity to make a Christmas craft. Adults and youth will work on decorating the sanctuary, narthex, and other spaces for Advent and Christmas. At 6:00 PM we will share a meal and the joy of experiencing the coming of Advent together. Families are asked to bring a crockpot of soup to share; cornbread, drinks, and dessert will be provided. We will begin the day with morning worship at 10:15 AM, followed by a delicious Christmas lunch in the Christian Life Center. During morning worship we will present Rejoice, the Lord is Near, our Advent cantata, featuring the chancel choir and guest musicians. From 2-4 PM that afternoon, Troy & Leigh Ann Tatum will host their annual open house for the congregation. Our morning worship celebration will feature special music from our handbell choir and baptisms and confessions of faith from some of our young people. FCC will hold three Christmas Eve services this year. The first will be at 5 PM on Dec. 23 and is designed for those who may be traveling or have other commitments on Dec. 24. 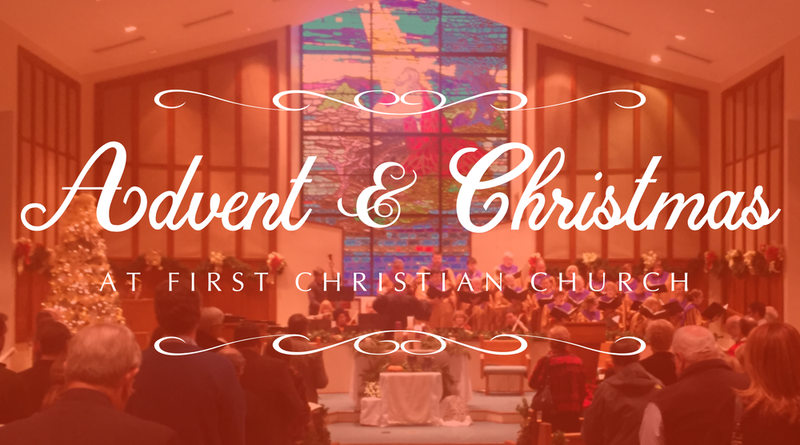 At 5 PM on Dec. 24 we will have a family-focused service that includes a children’s pageant (all children are invited to participate; no rehearsal required). At 11 PM on Dec. 24 we will have a traditional service of lessons and carols. All three Christmas Eve services will feature the Good News of Christmas in scripture and song, concluding with candlelight communion.